We know there are many questions about electroluminescent paint. Lumilor is a fairly new product that has yet to really hit the general market. Many people are still seeing this new technology for the first time. The patent for the product was issued in 2013, and in 2015, Lumilor Labs™ began certifying shops like ours in the Lumilor application process. Where did electroluminescent paint come from? 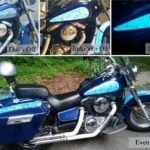 Lumilor is an electroluminescent paint that was invented in 2010 by Andy Zsinko, an aftermarket painter from Ohio, who initially played around with the idea of glow in the dark paint for his motorcycle. The problem with the glow in the dark paint was that it didn’t last very long and the light couldn’t be controlled. Zsinko then brainstormed the idea that is now a product called Lumilor, a sprayable electroluminescent coating system that can be applied to many surfaces, just like any other paint job. Electroluminescent paint is paint that lights up with an electrical current when it is turned on. The paint itself acts as any other paint would. It can be applied to most surfaces and becomes a part of the object. Electroluminescent paint, however, contains phosphorescent substances that will emit light particles (photons) when applied to an electrical charge. Wires are connected to the paint itself, but they are all hidden. 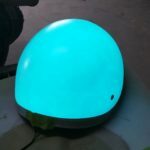 There is a strategic multi-layer coating process to applying the electroluminescent paint, but it can all be done with your typical spray paint air gun technology. The paint contains conductive materials that when layered with the other coatings, will ultimately produce a light. The paint is connected to electricity, but all wires are hidden, so all you see is a clean paint job that lights up. For a more in-depth answer, see: How does Lumilor work? Yes! 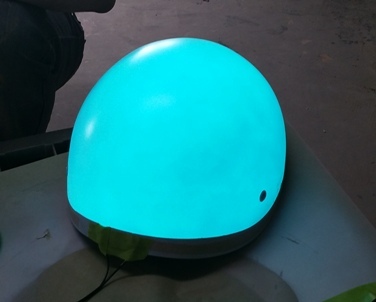 Electroluminescent paint is very environmentally friendly. In fact, it was recently showcased on one of the most powerful environmental activism documentaries to date; Racing Extinction. 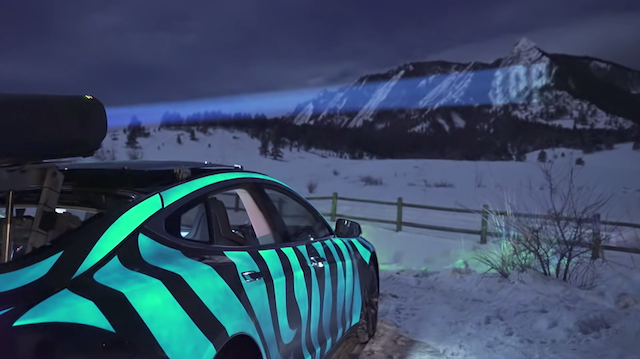 They took an electric-powered Tesla, and made it into a mobile projection vehicle with Lumilor electroluminescent paint as a way to promote their message to the masses. Read more on the Racing Extinction car. 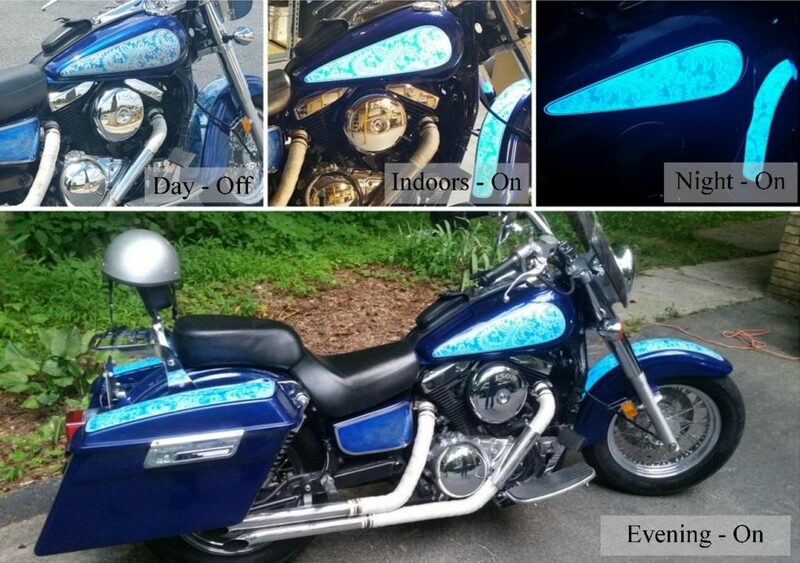 Electroluminescent paint is a great alternative to typical lights. While there is an electric charge to it, Lumilor is a much more efficient, eco-friendly product. How long has Lumilor been on the market? The entire concept of electroluminescent paint is very new. Lumilor was patented in 2013. The company began training and establishing a select few Certified Lumilor Labs in 2015; TD Customs being one of the first. Hasn’t luminescent paint been done before? Plain old luminescent paint (without an electric charge) has been used before, but with disappointing results. Without the electricity worked into the paint, the effect wears off after awhile without sunlight, and it dims quickly. It also only comes in one shade of glow-in-the-dark green. Is it really the paint that lights up? We get this question A LOT! Yes, it’s the PAINT that lights up! People are still seeing electroluminescent paint for the first time, so we understand it takes a minute to fully get that it’s the paint that lights up itself. Lumilor is a very new product. 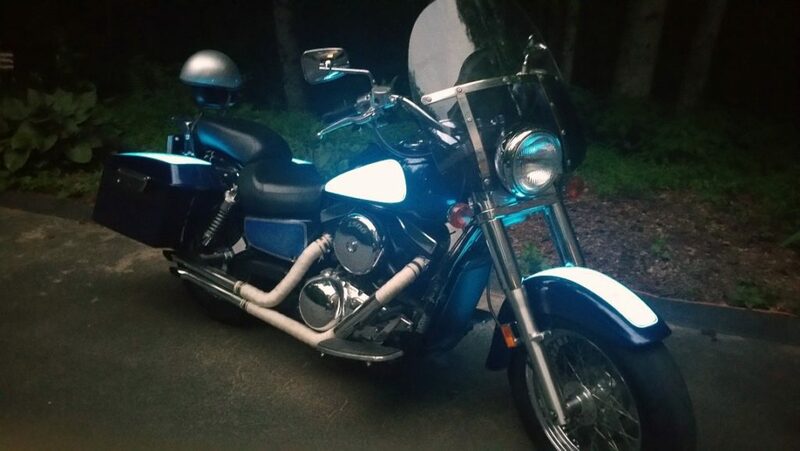 It is an extremely complex electroluminescent coating system rather than one simple coat of paint like you might expect. It takes careful application by a Certified Lumilor Lab, like TD Customs. What colors does Lumilor come in? Electroluminescent paint comes in white, blue, aqua, green, and orange. Due to the elements within the paint, color tends to react differently than normal paint, so other custom colors are not available at this time. Read a more in-depth explanation of the Lumilor colors here. How long will the charge last for? 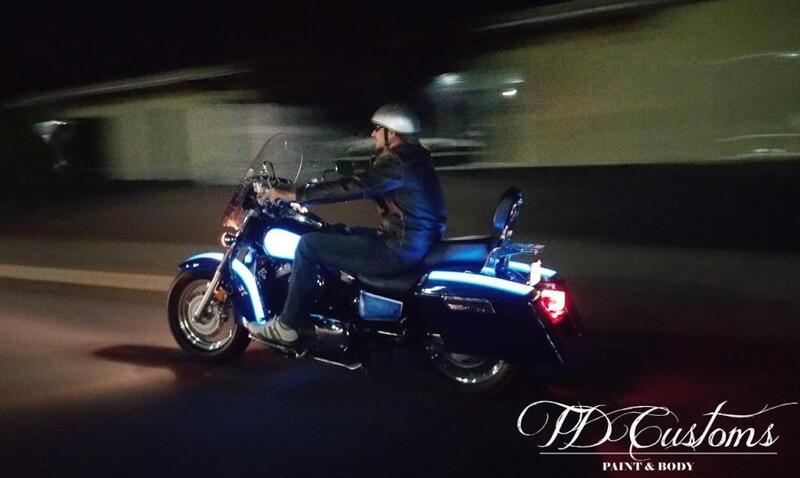 With the Lumilor electroluminescent paint coating system, there is an electric charge to the paint that allows it to become a light, lasting for over 50,000 usable hours. 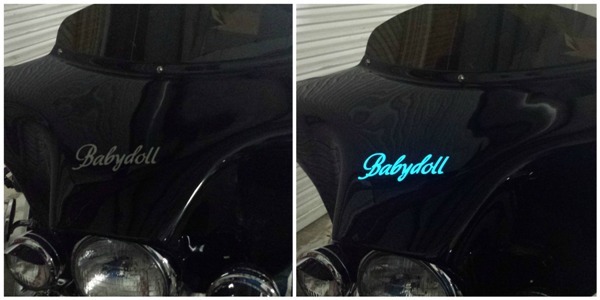 This equates to about 6 solid years, so it is safe to say the electroluminescent paint job will last a lifetime. How do you control the light? 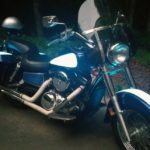 You can control the light through a switch or a button that we will install on the bike ( or you may install yourself through a fairing, etc.). You can also purchase a remote or an app for your smartphone that will allow you to control the light right from your phone! It can also be made to strobe in different sequences and can be synced to music. 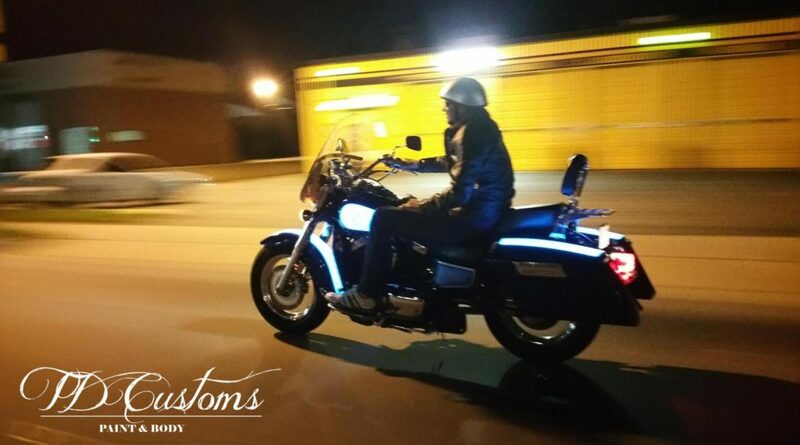 The product we recommend (XKGlow) will also track your bike’s location, if desired. Is there anything Lumilor will not work on? Yes, there are certain objects that Lumilor may not work on. Careful planning on how to paint and wire the job is often required, so we will discuss your project with you to make sure we are able to do what it is you want. Lumilor is always the base, and we apply top coat art after. Therefore, we cannot paint over existing paint jobs or decals/emblems. If we are not able to do the exact paint job you are after, we may be able to suggest other possibilities and work with you to create a new look. How much does Lumilor cost? TD Customs charges $4. 50/ square inch for the Lumilor materials, plus our labor to apply it. We also charge for any top coat paint work done on top of the Lumilor. We can discuss your design ideas and budget, and work together to come up with a design you’ll love. Read more on How much does Lumilor cost? How can I get a Lumilor paint job? 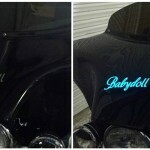 TD Customs is currently taking Lumilor paint jobs on motorcycles, helmets and small accents on cars. Fill our a Get Lit Request Form or contact us and we can discuss the details of the project. We are located in Mills River, NC, right outside of Asheville. 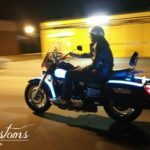 Customers who are not local may ship smaller pieces like motorcycle parts through USPS, FedEx or UPS. If you have any other questions about Lumilor, please don’t hesitate to ask. We’ll be continuously adding to this list of questions as they come.